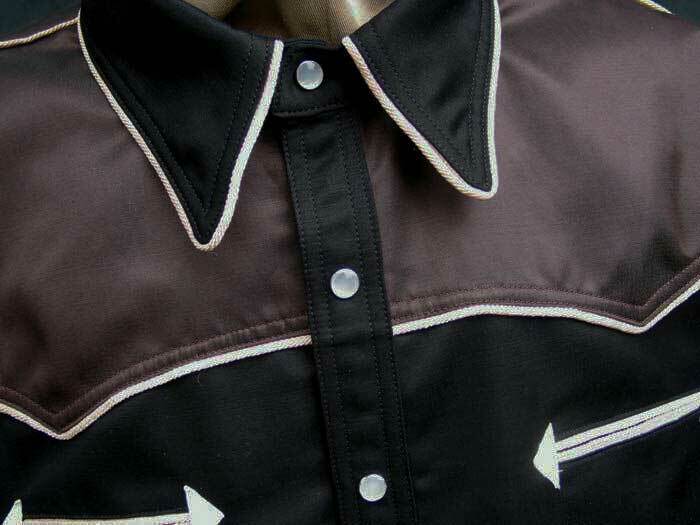 These matchless fancy Cowboy Shirts of 1930s-40s lineage in Long and Short Sleeve always amaze. They're simply unavailable elsewhere at any price. And given the detail and painstakingly accurate materials, they're reasonably priced. Ralph Lauren was once quoted as saying that the reason he became a designer was to make the shirts that Randolph Scott wore in the movies. We understood completely. 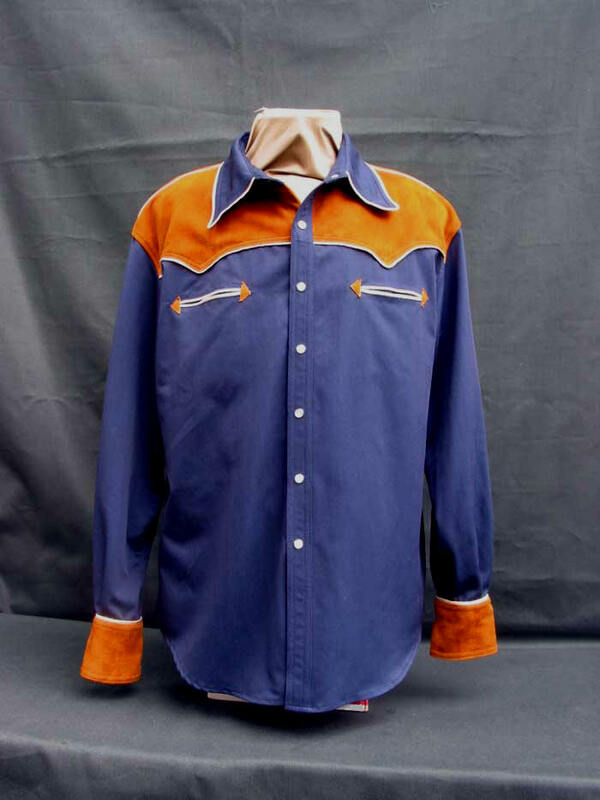 For those of us who grew up on great westerns -- Red River, The Dark Command, Western Union -- and on Roy Rogers and Gene Autry hokum -- in the best sense -- the classic movie cowboy shirts hold dear places in our collective memory, creating a mythic past that never existed but should have. See, in fact, Roy Rogers' 1945 Don't Fence Me In, where the hero wears a virtually identical shirt. 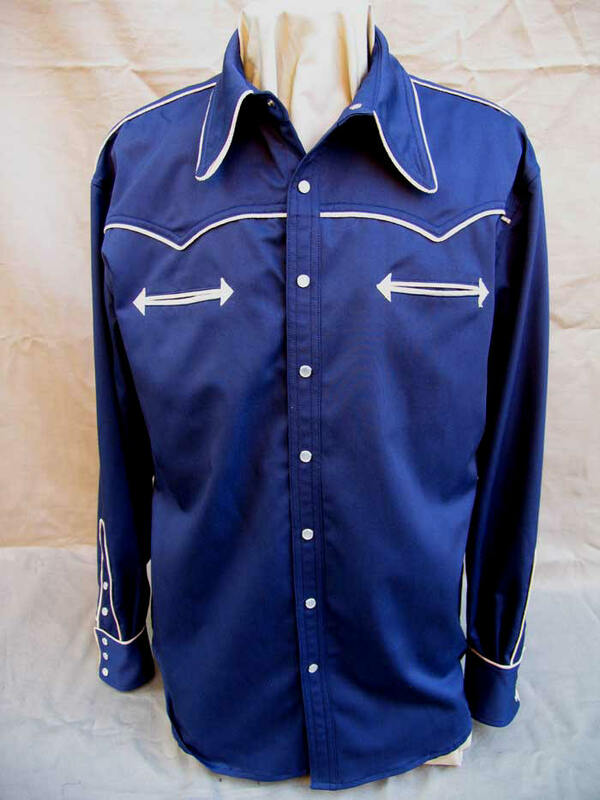 Your mood will change whenever you put on one of these remarkable shirts. Past and present will link up again, if for a little while -- the rupture of past and future denies us peace and a measure of happiness, stranding us in a waiting room present. The dilemma of the modern? (The post moderns -- Generation X -- aren't even alive ... walking zombies in thrift shop 70s nerd knits and those egregious wool condoms on their heads (when emasculated one unconsciously favors the missing "head," like one who's lost a limb!). 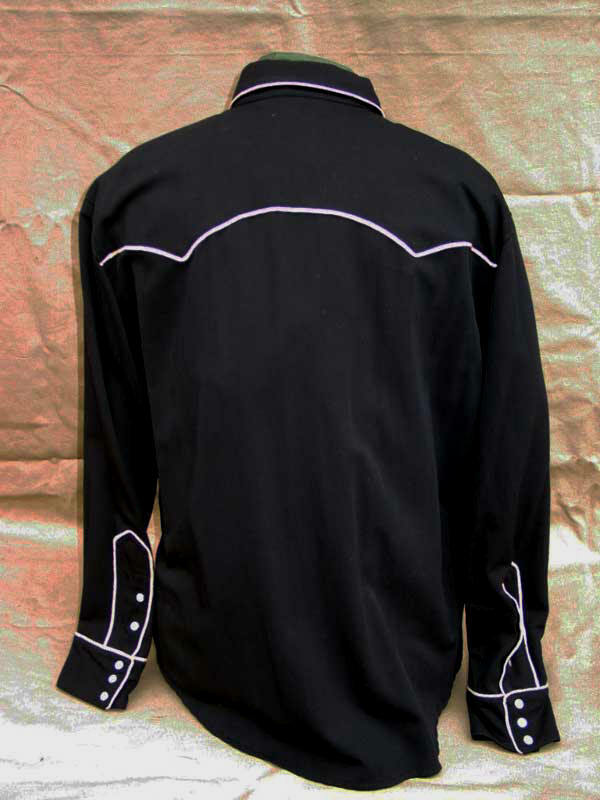 These Shirts are made, of course, of Rayon Gabardine, with yards of intricate Antique Pale Ale Rayon braiding. 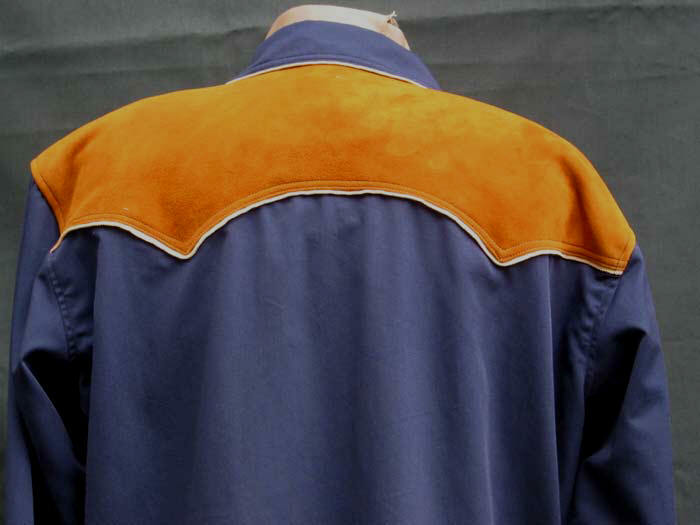 What's Rayon Gabardine? Rayon is called the first synthetic but actually extruded cellulose, wood pulp, chemically processed to render an extraordinarily soft, draping fabric of elegant, silken hand in ultra-fine gabardine weave with, however, plenty of body. It's not a skimpy, thin textile. Excellent, sturdy weight. No cotton of similar weight has the same drape and shape. Rayon became the fabric of choice in the 1930s-50s for both men's and women's clothing until pure synthetics like Nylon (another great fabric), then awful plastic polyesters, proved much more care-friendly when suburban, newly middle-class America all bought washing machines and the dreadful casualizing of American dress and culture began. 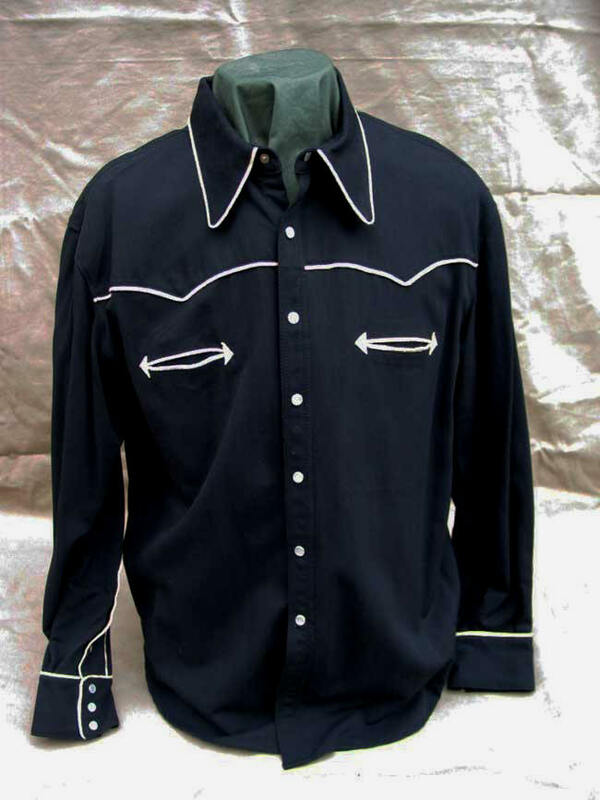 These Western masterpieces, however, should be dry-cleaned, just like the best dress shirts. Horsehide pocket tips, Rau pearl snaps. In a variety of Solid and Two-tone combinations. (Depending on availability.) (XS-XXL). �2009 L�©2019 VINTAGE HYDE CORP. All Rights Reserved.OST WORLDS All Rights Reserved.